The best ways to safely share content with external partners are to create a new site collection or create a subsite under your team site. A new site collection completely isolates external content from your internal team site. However, only an Office Admin can create it. If you don’t have an easy way to create a new site collection, you can create a subsite under your team site. Either way, external partners feel more comfortable with their own site, which to them is just like another web site on the internet. Create a new site collection. Make you the site owner. Add your team members and external partners. Send you the new site web address. Sign in to Office 365 with your work or school account, and then navigate to your team site (Click the app launcher , click Sites, and then locate your team site). Can't find the app you're looking for? From the app launcher, select All apps to see an alphabetical list of the Office 365 apps available to you. From there, you can search for a specific app. In the Quick Launch (the navigation links on the side or top of the page), click EDIT LINKS, and then click link. In the Add a link dialog box, enter the link text and the web site address. Make sure you precede the address with http://. Note: You need to be a member of the Designers group or have contributor permission to create a subsite under a team site. Choose Site Contents > new subsite. In the Title box type a name for the subsite, such as JoinForces, and in the URL box enter the same name. In the Template Selection, accept the defaults. For User Permissions, choose Use unique permissions. Security Note: Use this option to make sure external partners do not accidentally get access to other sites. Under Use the top link bar from the parent site, choose Yes or No, depending on your preference. On the Set up Groups for this Site page, add the names of the team members you want to contribute to this subsite, and click OK.
At the top of the site page, click Share. In the Share <site-name> dialog box, enter the email addresses of your external partners, select Can edit, add a short email message, and then click Share. Click EDIT LINKS on the Quick Launch (the navigation links on the side or top of the page). Select the link that you want to move and drag it to its new position in the navigation. Repeat these steps for each link you want to move. The optimum way to share information with our external customers is to create a new site collection because it isolates content from any internal sites. Since only an Office 365 Admin can create a new site, I’ll show you how to create a subsite, which any site owner can do. For the first option, I’ll ask our Office 365 Admin to create a new site collection for us, called JoinForces. I'll ask her to make me the site owner, add our team members and external partners, and send me the site web address. Once the new site is built, I’ll need to add a link to it from our current team site. 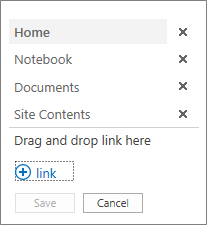 In the Quick Launch of our team site, I click Edit Links, then Link. In the Add a link dialog box, I'll use JoinForces as display text, and then paste in the web address my admin sent me. I click OK, then Save. And here's the new site for my customers, in its own site collection. To create a new subsite, I click Site Contents, then New subsite. I'll type JoinForces in the Title box, and I’ll use the same thing for the end of my URL. I'll keep the defaults for the Template Selection. Now, this part is important: to make sure my customers can access only this subsite, I need to click Use Unique permissions. I'll click Yes under Use the top link bar from the parent site, and then click Create. To add my teammates, in the Set up Groups for this Site page, I add the names of my team members, and then click OK.
To add our external customers, I click Share at the top of our team site page. 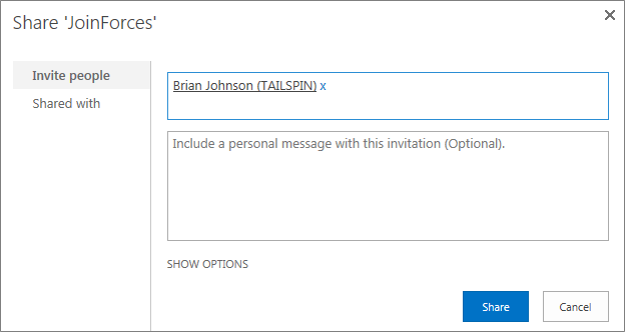 In the Share JoinForces dialog box, I enter the email addresses of our external partners, make sure "Can edit" is selected, add a short message, and then click Share.